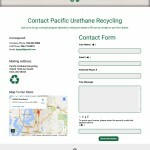 WordPress 1-Pager For WA Recycling Co.
A nature photo was used to emphasize the benefit of recycling. 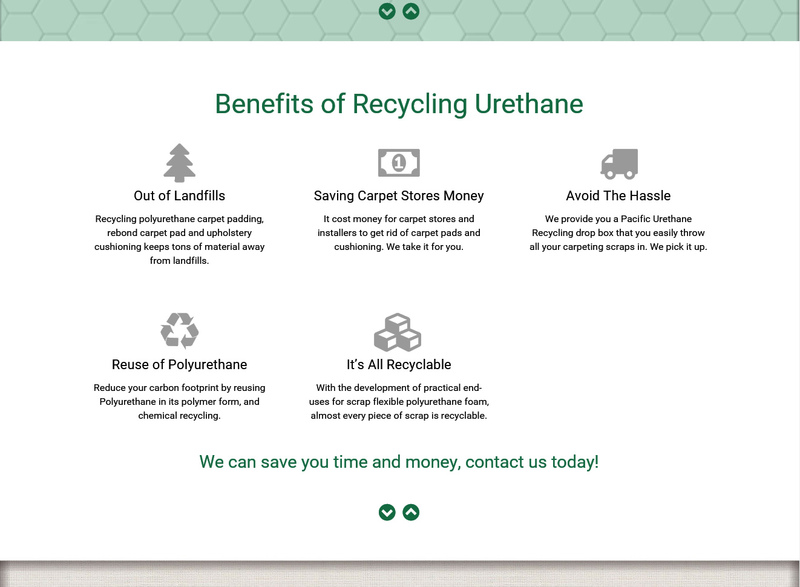 Responsive design of company benefits page. 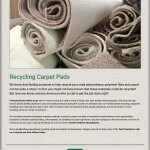 Here's the Benefits layout on a tablet display. 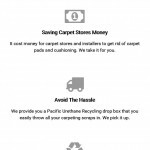 Here's the Benefits layout on a mobile device. Benefits are easily edited and created with custom developed WordPress Panels. 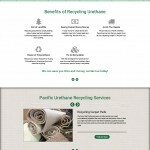 The Webvisuals responsive, 1-Pager website was perfect. 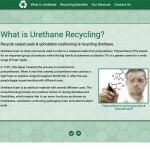 Going to this site you found everything you needed to know on 1 scroll-able webpage with two sliders. 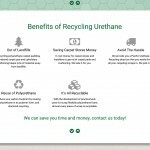 Dave had built his company into a sizable warehouse in Kent where he ran his Urethane Recycling business. Not being a technical person he dreaded putting together a website even though he knew he needed one. 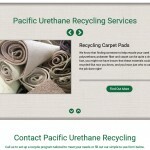 Enter the perfect solution, the Webvisuals 1-Pager website. 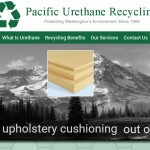 For marketing purposes Pacific Urethane Recycling had a 1-page flyer that is used to advertise it’s business. We took that and ran with it. 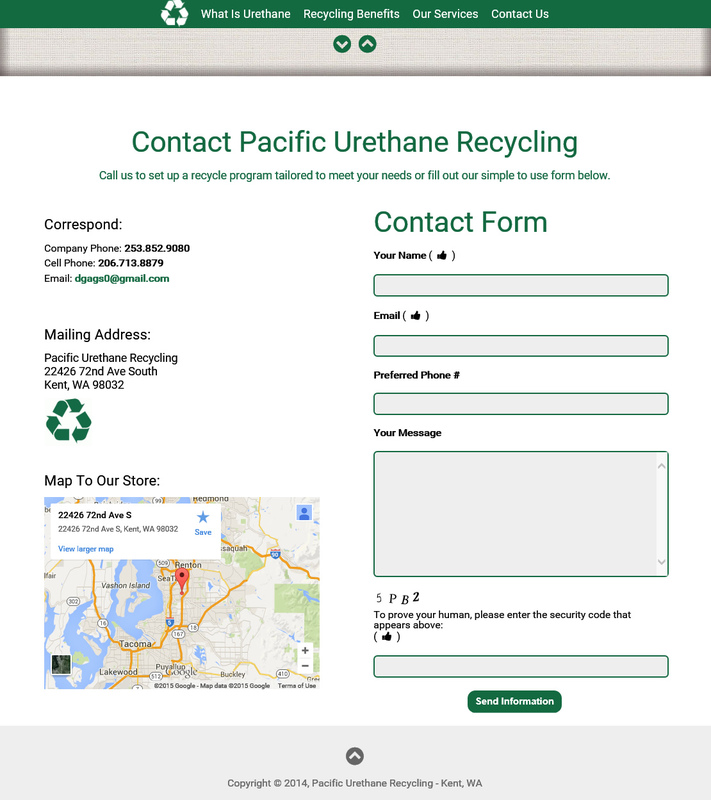 For branding, we matched up the stock green color on their business cards and used that as our main color in the user interface design. We chose a medium charcoal gray as the complementary color. 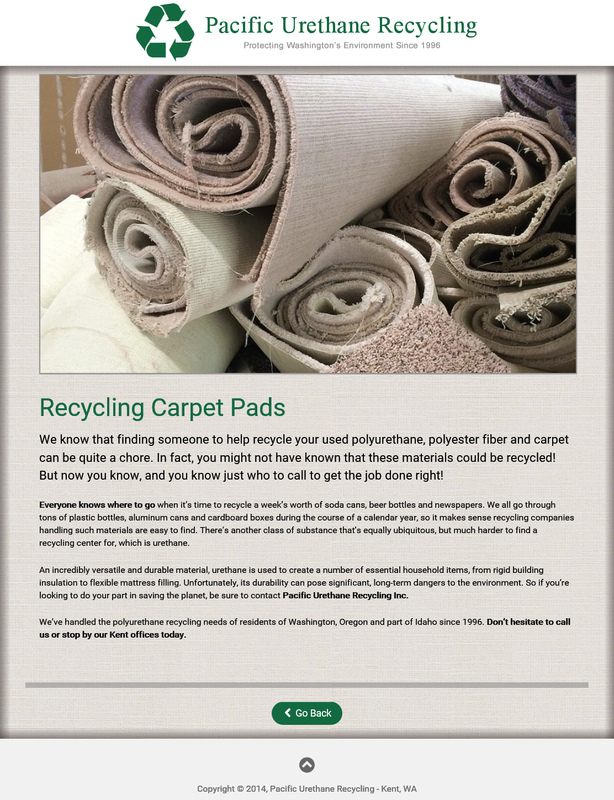 To separate them from the pack we used imagery that projected an industry expert in the recycling of carpet pads and other types of urethane. 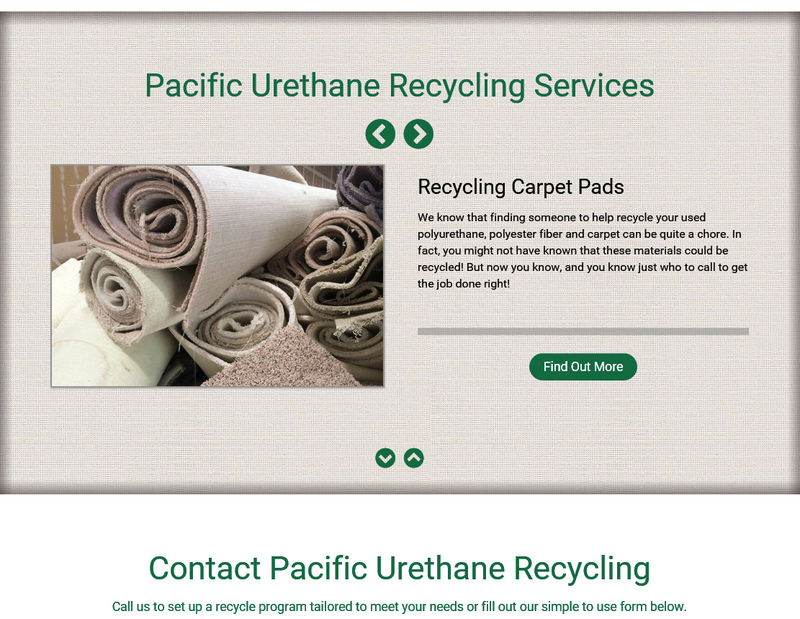 To control the content on his custom designed 1-Pager website, Dave has easy-to-use administrative tools to edit and add his company benefits and services along with changing the intro to keep timely with current events. 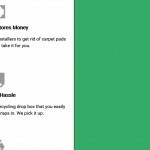 The Services section has a slider that shows a photo and text overview of that service along with a button to go to a Services landing page which contains all the relevant content. 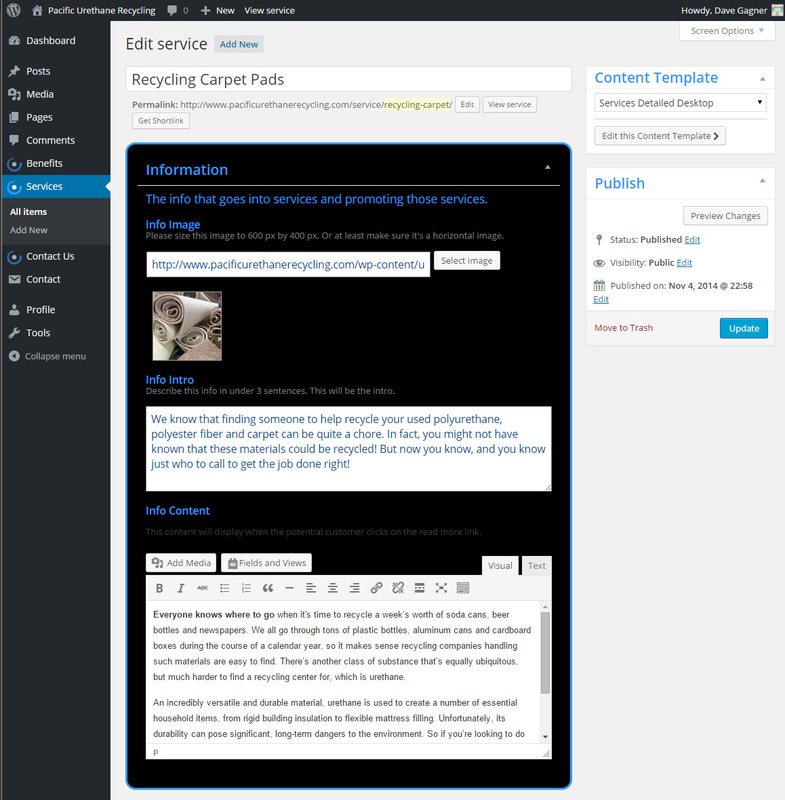 With search engine optimization built into a Custom 1 Pager Theme for WordPress, all Dave has to worry about is writing the content and uploading a photograph. Everything is automatically connected behind the scenes and outputs rock-solid SEO techniques to get ranked in search engines. 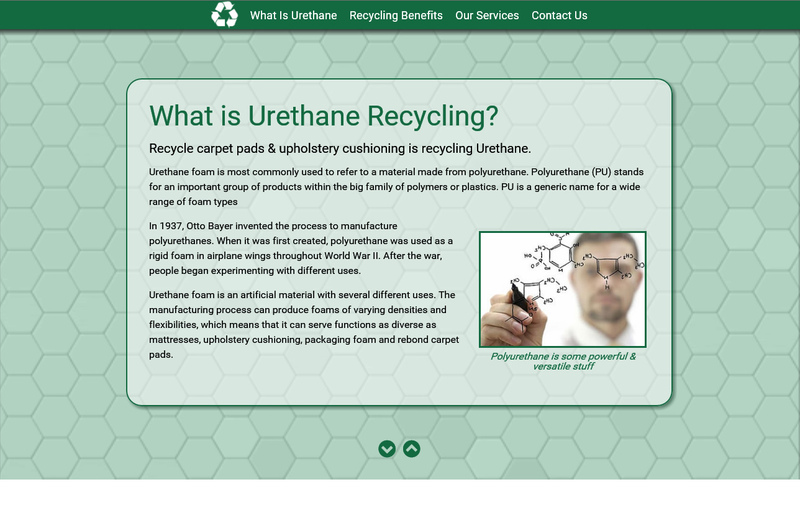 Now when people type in urethane recycling in Google, they show up second on the first page. 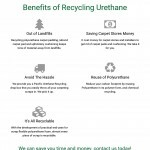 I was looking for a good way to start my internet presence without alot of time or money invested. 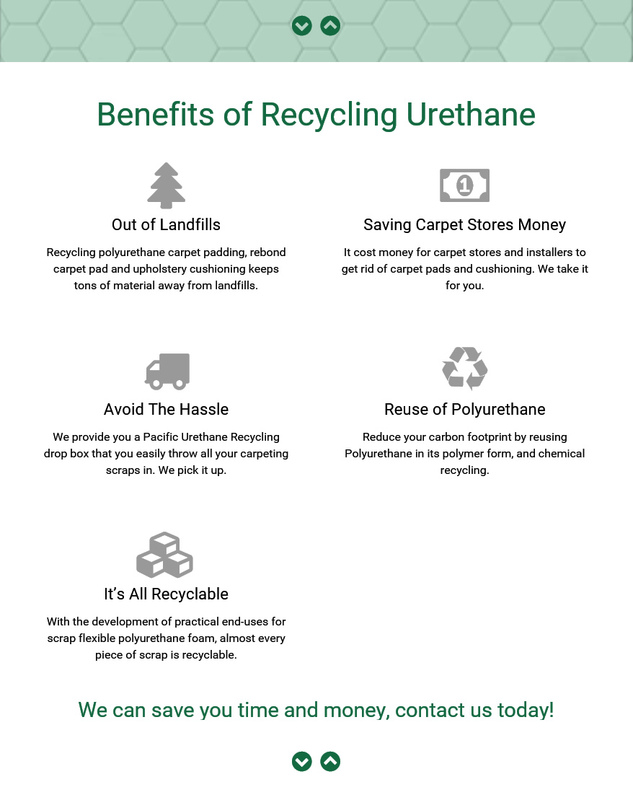 The 1-Pager was perfect, people can see what were all about in less than 10 seconds then contact us.